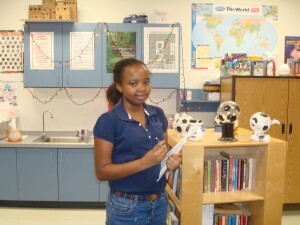 Fifth grade student China Whitehead from Christy Nuccio’s class at F.K. Sweet Elementary School recently won second prize for her essay on the Statue of Liberty. The local VFW sponsored the contest open to all fifth grade students in St. Lucie County. 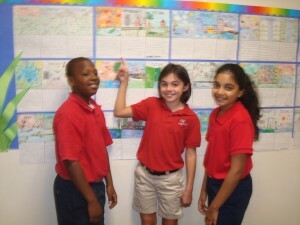 Students Everett Braynen, Isabelle Storck, and Rita Ahmed from Jodie Steele’s fifth grade class at F.K. Sweet Elementary School are pointing out their completed poster projects on the Everglades. Students researched information of the past and present conditions of the Everglades, and offered suggestions that might lead to restoration in the future. 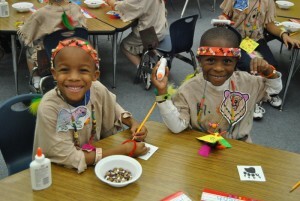 Morningside Elementary kindergartners Jeremiah Griffin and Elijah Laguerre are making bear claws for bravery. Kindergarten students listened to a story about a Native American who was brave in the face of danger. Students then shared their experiences of being brave in different circumstances and made their own bear claw for bravery badge.